I used wonderful speckled yarns, made by Hedgehogfibres, WalkCollection and Madelinetosh - just feel free to use DK-weight yarn from your stash. 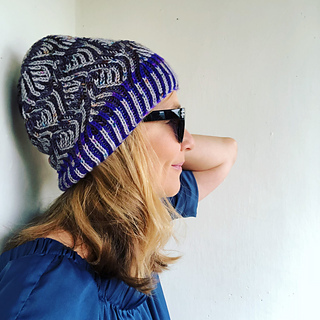 The hat has a brim, is very stretchy, slightly slouchy and well-fitting at the same time. The pattern has eight repeating rows and is based on basic brioche stitches, increases and decreases. It’s important to note that there is no 4-stitch-decrease to be knit. You can do it, knitters! Orange version shown was knit with Madelinetosh Tosh DK ( 100% Merino, 225 yards/ 206 meters /100g) in Citrus (BC) and Hedgehogfibres Merino DK (219 yards /209 meters/100g) in Gobelin (DC) and Juniper (LC). Purple version shown was knit with Hedgehogfibres Merino DK (219 yards /209 meters/100g) in Spell (BC), Raven (DC) and Salty Tales (LC). Green version shown was knit with Walkcollection Merino DK ( 100% Merino, 225 meters /100g) in Nomad (LC) and Caribbean (DC) and Malabrigo Rios in Cereza.